Discussion in 'Portable Headphones, Earphones and In-Ear Monitors' started by csglinux, Dec 2, 2018. Do you like the boosted mid-range in the CL2? Midrange boost goes away if you use Spiral Dot eartips with a copper cable and face Mecca. I was a bit puzzled by the tuning of the RHA CL2. To my ears, it sounds way off. But, as we often say, frequency response can be subjective. Is this size of a boost still subjective? Please cast your votes and/or leave your comments below! Seems to measure similarly to the Massdrop Planamic, of which I kind of hated. Hi mate. Your review on Xelento sold me on it. Have you tried CL2 and what’s your opinion of it compared to Xelento? I was eyeing on CL2. The only thing I wish Xelento could improve/have is the isolation but DD need venting so I can’t have it all. Its boosted but not as much as your graph shows, it can be attenuated with copper cable, more importantly with burn in. it was picky when it was new , now i have more then 200hours on them and piks has almost gone. but still some badly mastered albums sounds shouty. One of the few things in your review I agreed with is there is no burn in, Mine were outstanding about a half hour in. Yet they sound nothing alike. It's still present at 400+ hours, but nowhere near as much as within the first couple hundred hours. I have it EQd slightly, and what you pair it with makes a big difference. I wouldn't pair with a ESS9018k2m dac, for instance. 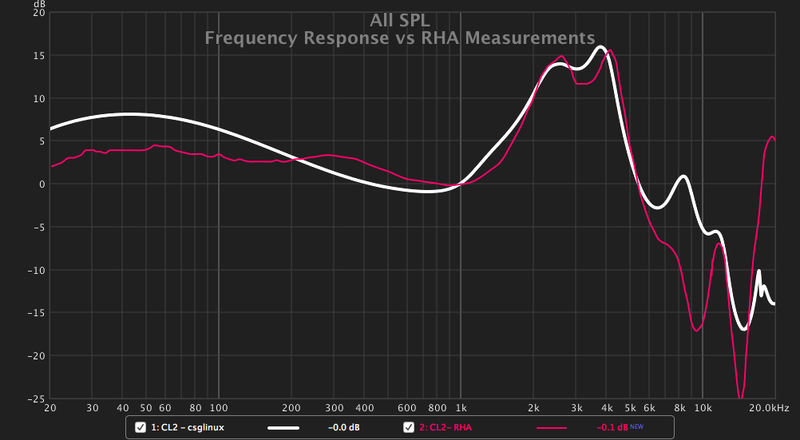 You are wise not to trust random measurements thrown up on headfi But look at the red curve, which is direct from RHA. 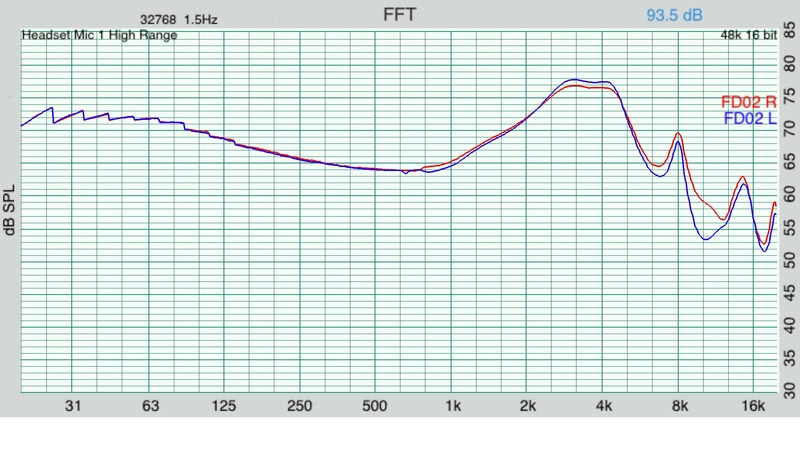 According to RHA, all CL2 units sound like this within a margin of +/-1 dB. The CL2 already comes with copper cables. You're right that you could shift things with a higher-Z cable, but you won't change the FR there by more than a dB or two. What I observe is similarity to the FR of Audeze Mobius, which is also a planar, but full-sized. It takes a certain number of hours for the bass to fully open up, once that happens the peak blends in better with the rest of the signature. 200-350 hours by most accounts. The tuning is geared towards clarity and separation, and outside of a few poorly mastered albums, it is brilliant to listen to. Most realistic and lifelike timbre with a balanced copper cable I have ever had the pleasure of listening to. The bump might look crazy on a graph, but is very enjoyable on almost every album you throw at it. This thread and the last option on this poll is what happens when graphs go crazy. Next time I'll forgo an iem, and will just buy a bunch of graphs and post them on my wall. All hail the divine graph!! Double posted, because there are some points here that need clarifying on both threads. Nowhere, in any of my posts, have I insulted anybody's mother. I have not said the CL2 is a bad headphone. I think it's an excellent headphone in every regard except one: I don't like its tuning. The purpose of the little poll was to find out what proportion of people actually like the mid-range boost and/or don't think it exists (which I'd lump in with liking it, since you can't be concerned about something you don't even notice). There can't possibly be one headphone that works for everybody, but I am curious to know whether this tuning is something that would really maximize RHA's headphone sales. Of course, that might not have been their goal. They may be artists who don't care about sales numbers, and if so, I'd respect them all the more. If you actually LIKE the CL2 tuning - great - you have an endgame IEM. Enjoy it. It's utterly pointless to debate which flavor of ice cream is right and which is wrong. To me, the CL2 is a vanilla and anchovy ice cream - it's very unusual and not to my liking, but if it works for you, that's all that matters. mia123, ZenErik, antdroid and 3 others like this. Nowhere, in any of my posts, have I insulted anybody's mother. I have not said the CL2 is a bad headphone. I think it's an excellent headphone in every regard except one: I don't like it's tuning. The purpose of the little poll was to find out what proportion of people actually like the mid-range boost and/or don't think it exists (which I'd lump in with liking it, since you can't be concerned about something you don't even notice). There can't possibly be one headphone that works for everybody, but I am curious to know whether this tuning is something that would really maximize RHA's headphone sales. Of course, that might not have been their goal. They may be artists who don't care about sales numbers, and if so, I'd respect them all the more. The way certain users respond to reviews of the CL2 is W I L D.
ZenErik, antdroid, Spandy87 and 4 others like this. It tends to be that way when reviewers start off video reviews claiming people enjoying the iem are paid shills by the said company. And a less egregious, an probably unintended dig on a whole group of long term listener's experiences by equating driver burn in, tip rolling and timbre of copper cables, with praying towards mecca. Maybe reviewers should stick to reviews and not dissect or psychoanalyze the opinions of people that own and are enjoying the iem. This is also a great inear with very forwarding energetic mids - first time you will find it annoying, but after a little perid of brain adaption you maybe will like it. It can also be fatiguing with tracks with high dynamic range - than the mids can get aggressive. I think this could be the same story with CL2 and i can understand why people love their CL2.